The first seed stage venture capital fund designed for Arizona technology founders on their way to building exceptional companies. 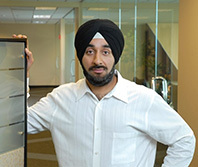 Mr. Ruminder Dhillon was an Associate at vSpring Capital. He is a Senior Associate at Kickstart Seed Fund. Prior to this, he worked for Thunderbird School of Global Management in Phoenix, Arizona. As a full-time student, Mr. Dhillon also worked full-time as a Strategy Associate at Evolution Capital Partners. Prior to that, he managed the India Practice Group for The Conrad Group, LLC. Mr. Dhillon holds an M.B.A. from Thunderbird School of Global Management in Phoenix, Arizona; an M.A. from Columbia University; a Certificate in Venture Capital Development from the Indian School of Business in Hyderabad, India; and a B.A. from Emory University. eVisit eVisit is a web application that connects primary care providers with their patients by webcam or phone for the remote diagnosis and treatment of most minor medical conditions (i.e., cold, flu, allergies, etc). eVisit is changing the healthcare delivery model and disrupting the $135 billion dollar primary care market by allowing physicians to recapture patient visits from the Urgent Care and Emergency Room. Physicians reclaim lost revenue from missed appointments, and patients receive high-quality care from work, home or on the road from the doctor that know them best, their doctor. Shelvspace We are creating the first true mobile, cloud-based sales platform for consumer packaged good brands, distributors, and brokers. We provide a smarter, faster and cheaper way to promote retail products by putting powerful mobile sales tools, data, dashboards, and store level execution tools in the hands of sales teams and executives. InHouse InHouse is a web marketing and relationship nurturing platform that allows Mortgage and Real Estate Professionals to modernize their practice, collaborate, and connect with the mobile and more tech savvy information driven home-buyer and seller. BAYiQ BAYiQ is a cloud-based data, marketing, and rewards platform that facilitates the creation of loyal customers for life. BAYiQ offers a powerful, highly scalable, enterprise-level marketing suite that combines all critical marketing functions into one powerful automated platform. We provide first to market real-time promotion management and analytics to Program Marketing Directors, suppliers and manufacturers.